Asian cuisine is my most favorite. I usually have Vegetable Stir Fry and Fried Rice at least 2 or 3 times a week. It’s easy to make, doesn’t take long and uses only 1 pan. When I don’t have any rice prepared and still want a quick and yummy meal I whip up this delicious noodle inspired dish. 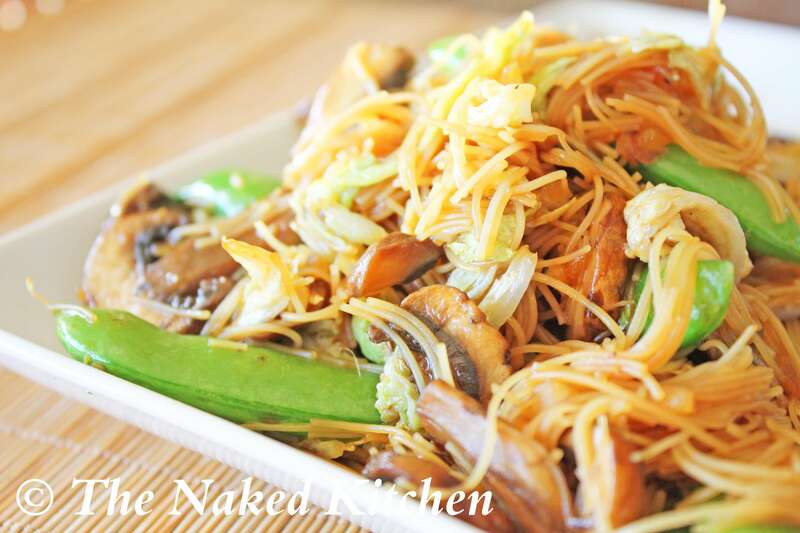 Brown rice noodles take only a few minutes to prepare and you can add any of your favorite vegetables to make this dish your own. Enjoy! 1. Cook the brown rice noodles according to the directions on the package. Once they are done cooking set them aside. 2. While the noodles are cooking add a tsp of sesame oil to a large sauté pan or wok over high heat. Once the oil is hot add in the napa cabbage. Cook for about one minute. The cabbage should be bright in color and still have some of it’s crispness. Remove the cabbage from the pan and set aside. 3. Add another tsp of oil to the sauté pan or wok and once the oil is hot add the sugar snap peas. Cook the peas for 2 minutes, stir occasionally. The peas should be bright in color with a slight sear on them. You can add a tsp or so of water to the pan to get a really good sear on them. 4. Remove the peas from the pan and add another tsp of oil to the pan. Once the oil is hot add the mushroom and cook about 2-3 minutes. Mushrooms contain a lot of water. You want the water to be cooked out of them. Depending on the type of mushrooms used you might need to cook them a little longer. The mushrooms should be golden brown, deep in color and the water should be completely cooked out of them. Remove the mushrooms from the pan and set aside. 5. In a small bowl add the coconut crystals, rice vinegar, soy sauce and remaining tsp of sesame oil. Stir the sauce well and set aside. 6. Bring your sauté pan back up to high heat and add in the shallot, red chili, garlic and ginger. Cook, stirring occasionally until the shallots are translucent. 7. Add in the sauce and give everything a quick stir. Add the napa, peas and mushrooms and stir until everything is nicely coated with sauce. Add in the cooked noodles and stir again.